Home on the PS3 has been out for well over a month now. Since then there have been updates to the software plus additional content so it seems more appropriate to scribble down my thoughts. Home is downloaded and installed on your PS3. It’s accessed from the XMB as if launching a game or separate app. Initially I couldn’t connect to Home but after the first update I’ve been find. Some of my friends have still been unable to connect though. After 5-6 weeks. Sony admitted recently that they had released Home too early – it certainly looks that way based on my experience. Once in Home you start off in your house. You can buy other homes and also furniture for your current home. I used the word buy – get used to it. While there are some things for free in Home, a lot of the content is pay for only. One other aspect to get used to in Home is waiting. As you move from your Home to the shopping centre, cinema, bowling alley, arcade games, basically any new area, you need to download and install that area. I found this tedious and took away any feeling of inversion in a virtual world. Even worse, the bowling alley, pool tables and arcade machines – you need to queue to use them. If they are in use you need to wait your turn. I do not jest. In a virtual world Sony have implemented queue’s. Unbelievable. Who thought this was a good idea? It would be bad enough if the games were worth playing but they aren’t. Virtual Pool on the iPhone is leaps and bounds better than the pool found in Home. A new addition is Red Bull Air Racing but this is no better than a few years old Flash game. Very disappointing. Add to this a cinema where you can watch movie trailers and quite a few shops where you can buy clothes, furniture and features for your house and you have one of the worst features of the PS3. I can’t believe this was once talked about as a dashboard replacement. Wipeout on the PS1 heralded a generational leap in home consoles. It was the essential launch game for Sony and it left a long and satisfying impression on me. Updates over the years have ranged from middling to good with the two games on the PSP being particularly good. WipEout HD has now finally arrived for the PS3 as a downloadable PSN game. Does this mean it’s a cut down game? Far from it. The screen above is from the actual game. Jaw droppingly good. Screens however can mask how a game actually moves but in WipEout’s case (why the uppercase E???) the game is so smooth, fluid and best of all fast that it’s a joy to behold. I’ve been playing it since Thursday and I’ve yet to see a drop in frame rate or a graphic effect that seems out of place. The menu’s and overall graphic design is excellent. 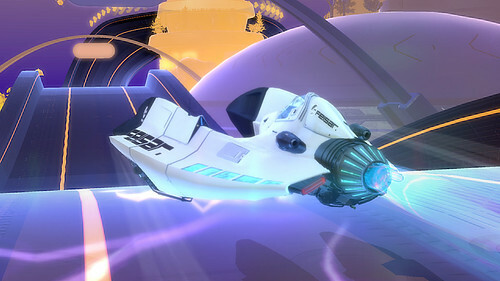 Each new mode or track offers something new and fresh. Coupled with that is a great soundtrack. The original Wipeout changed how game music was used. Established bands like Leftfield and Chemical Brothers provided some of the tracks and it was so fresh and different from other game at the time. 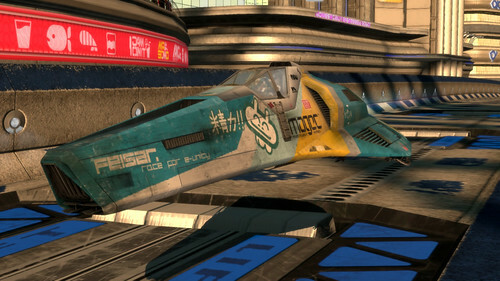 WipEout HD doesn’t have the same impact but it’s still quite good. You can also use your own music by creating playlists on the PS3. Unlike the Xbox though you can’t listen to music streamed from from Mac’s or PC’s but at least there is an option. More important than any audio or visual concerns is the handling and feel of the craft. Mess that up and the game is a waste. For me the handling is spot on. The craft have a real weight to them. As the game speeds up it can get difficult and there is a pilot assist mode to help but don’t use it – once you get used to the handling it just feels so right and getting it right without any assists is so satisfying. There are a few game modes but strangely less than on the PSP versions. 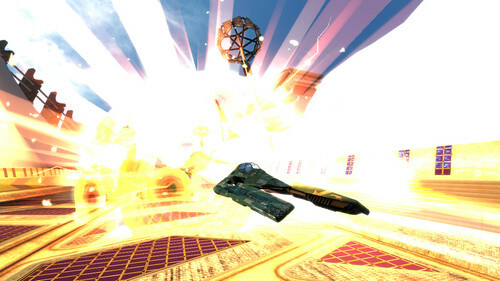 You have the normal race and tournament modes and fastest lap, time trial modes. Thankfully the zone modes from the PSP games are included. The graphics are stripped down (see above screen) and you have to try and clear as many zones as you can, your craft getting faster and faster as you clear the zones. It’s a real challenge and is very hypnotic. You unlock more tracks and challenges via the Campaign mode. As you progress in this mode there are more options unlocked in the Racebox mode. You can basically set up any style of game for any track and then race it. Great flexibility which also applies to the online mode. I’ve only had a few online games but they have all been excellent. Still very quiet compared to the Xbox due to a lack of headsets but online felt very smooth with little signs of lag. It’s also a lot more competitive than the offline modes. So, any negatives? Well there is a reported bug that the game locks up if you have a friends list of more than 50. There’s also people reporting general lock-ups but I’ve not seen any. There’s also only eight tracks, which can be reversed, which feels a bit tight especially as they are lifted from the PSP games. However the tracks have been totally remodelled and look superb. Eight tracks also doesn’t sound so bad when you hear the game costs £12. It’s available as a download only but this is an absolute bargain. Don’t let the fact it’s available on PSN put you off. This is a high quality game full of customisation and unlockables to keep you playing all the while adding a superb online mode. There’s also a photo mode which allows you to take pic’s and save them to the PS3’s hard disk and I’m sure there will be future track packs available to extend the game even further. 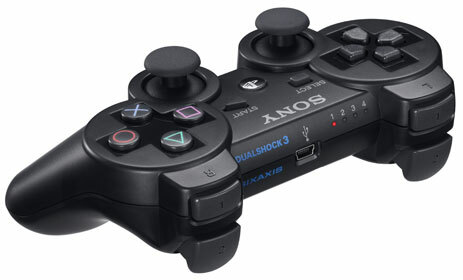 This is an essential purchase for the PS3. Cheap, great gameplay and some sublime graphics makes for a really good package. The PS3 would have got off to a much better start if, like the PS1, this had been available as a launch title. Looking like a strong period for PS3 with Little Big Planet coming in October. About time. I’m off to create a Wipeout playlist or two. Hopefully see some of you online soon for a race or two. Some initial random thoughts from my first 30 mins on single player…and first three hours on multiplayer. If you want it summed up in one word – unmissable. Very cinematic intro – don’t skip it! Rich environment, great graphics. Lot’s happening around you that you need to spend time looking at and taking in. So big. So much to see. Massive scale. Cars are varied and handle superbly. Different and takes time to get used to and you need to brake. Loving the wheelspin’s and momentum of vehicles. Not done enough single player to say any more. Same old GTA fare by the looks of it which isn’t a bad thing! Multiplayer takes a bit of getting used to. it probably helps to have done some offline missions first and get used to targeting, cover system, changing weapons. I didn’t and i suffered!! Multiplayer offers the whole of Liberty City if you want it. Deathmatch, Team Deathmatch and a few other modes that I didn’t have time to try. Cops and Crooks is a great game mode though. So much fun! So many ways to kill/die. It can feel overwhelming though. Thankfully there’s an option to respawn nearby where you died. Keeps you close to the action – anything else could lead to boredom crossing the map to get to enemy team. Racing modes are fun. Losing car after death though and getting a scooter can be frustrating but superb for your frineds. Rockets on a small map is frantic. Rockets look superb! No mute. Loud Americans! XBox Live should allow you to default voice communications by region/countries. Mute all yanks! Helicopters! A great way to travel. It’s a sandbox game so don’t expect the honed multi-player of Halo, CoD, Forza etc. it really is up to you how you want to play. Soundtrack ticking boxes so far. Heard Queens One Vision and some Phil Collins tonight. So. Some initial thoughts mostly all positive. One also closing note. Glad I picked up 360 version over PS3. Some reviews have mentioned better graphics on the PS3 but this comparison between both shows me that any difference is hard to spot. It’s also been found today that the res of the PS3 version is 640p against the 360’s 720p, that the PS3 multiplayer service has been down and had connection issues today and also that the PS3 version is freezing. Solution – delete your game save and also the game install. Nasty. Xbox Live (for me anyway) performed without a hitch tonight. Great to login and see 15 friends all playing the same game. Can’t wait to really get into the game. More thoughts probably next week on how it plays after a few days. The title that the PS3 has been waiting for or a glorified demo that is a shameless cash in on a game starved community? Depending on how much time you give the game you could easily walk away with either impression. Playing GT5 Prologue brings back a lot of memories. Lovely menu’s, soft jazz elevator music playing in the background and some slow cars to get you into the game. It’s always wrong to judge Gran Turismo titles on initial play as it usually has real depth that unveils as you play more. However in single player, playing though the first three classes is fairly dull. I don’t think I played a challenge more than twice to complete it until I hit A class. Even then the only reason was to get money to buy cars to complete challenges. What a grind. This was supposed to be a racing game, not a grind game. It took a long time of repetitive gaming to get enough money to buy cars to complete A class. However completing A class open’s up a far more interesting game. S class is unlocked and also car tuning. Suddenly the tweaking that is the heart of getting fast times and better handling out of cars is available throughout the game. I can’t understand why the dev’s would want to lock this out until now. The earlier modes aren’t that challenging and quite a few people will never even get to see this part of the game due to boredom of having to grind. S class is excellent though. Fast cars and some great challenges. Also excellent are the car models and the variety. For a cut down game there’s more than enough to keep you occupied including a 2007 F1 Ferrari. It only costs £2,000,000 though so it’s something I’ll never probably see. 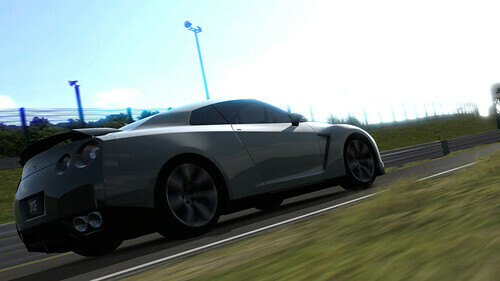 Graphically the car models are stunning – far more impressive than Forza 2. Not so impressive are the tracks. They range from good (as in almost as good as Forza) to poor. Some graphical glitches and vsync issues mar some tracks. There are also only six tracks so not much variety. Remember though that this is prologue only though. One of the big claims from Polyphony is around the online modes. In fact there have been claims that this is the best online console racer. Ever. With races of up to 16 players it sounded good on paper but in practice it’s pretty ugly. Firstly there are no private rooms, no friends lists and a real lack of community. This will be fixed in a patch. Allegedly. Online works by offering events that you can take part in. Early events use slower cars. People taking shortcuts or barging into others aren’t penalised. There’s also the issue of no car damage and also the fact that on many courses, not slowing into corners and using the barriers to keep you on the track is the fastest route. Cue online gaming at it’s worst. If there is a collision the two cars go invisible to limit damage. I was amazed as someone raced into the back of me, us going transparent and him keeping most of his speed (don’t think he touched his brakes at all) and continuing to drive through me. Unbelievable. Damage is also promised later in the year. S class events offered some hope in that people taking to grass and barriers are punished by slowing their car for 4-5 seconds. Except that people shunted off track by idiots are the ones punished…not the real cheaters. Hopefully Polyphony will fix this before the proper game. They’ve allegedly got a year. Something they don’t need to address though is the car handling which is superb. Each car handles and feels differently but feels…right. However it doesn’t feel any better than Forza 2. Computer AI is abysmal though. Awful in fact. AI cars will continue on their path no matter what’s in there way. Polyphony also added events like AI cars spinning out during a race. This is spoiled though when you realise that offline events are scripted. Every race is the same. A car putting a wheel on the dirt and kicking up dirt does it on the same track at the same corner at the same time each and every race. Really takes away from the atmosphere. So it’s really a mixed bag. Give up before S class and your left with a pretty bad taste. Grind out some money though and there’s a really enjoyable racer hidden away. Just don’t expect much online. Also, don’t buy via download which costs £24.99 while the Blu-Ray disk costs around £18 online. So much for digital distribution reducing costs. More like increasing profits. One final thought. This isn’t a console seller. If you’ve already got a 360 then Forza 2 is a far better game. Next year when the full GT5 is launched could be a different story.